Beautiful morning in Connecticut with this brand new family of 4 (and their fur baby) during their Newborn Photography and Film Session. Bringing home your new baby and walking through the doors of your home for the first time, into the space where so many first moments will happen and the spot where your memory will bring you back to years down the road time and time again is such a special moment. This parenting duo got to do that times two, all in one day with their baby girls. These little ladies will be their very first playmates for each other, their first best friend. 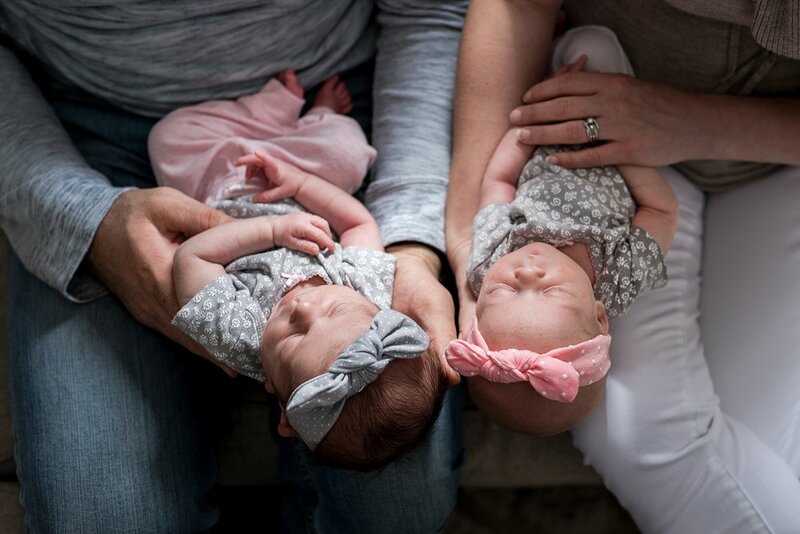 Right now their home is filled with quiet moments of sleepy newborns (and of course the occasional cry fest) but in the blink of an eye it will be filled with double the smiles and giggles. 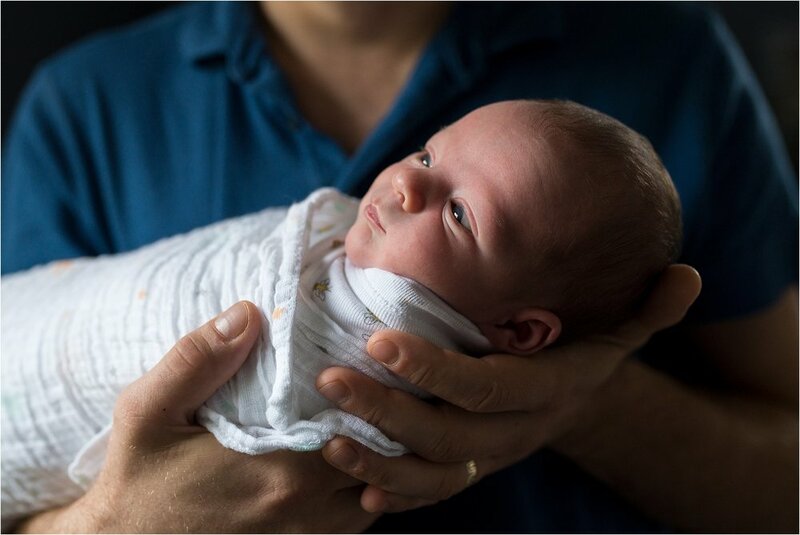 Lifestyle Newborn Photography in your home is a wonderful way to capture your baby's first moments in their new world. Lifestyle newborn photography is different than studio/posed newborn photography. It is more simplistic and free flowing, focusing around your baby's schedule. The session allows for plenty of time for feeding and changing. Lots of snuggles and swaddling. A question I get asked a lot is if there is an age limit for lifestyle newborn photography. The relaxed style of lifestyle newborn sessions don't require your infant to be less than 8 days old, as they would need to be for posed studio photography in order for them to stay sound asleep for hours being posed. Lifestyle newborn photography encourages snuggles with mom and dad, swaddling, and being in the comfort of your home. Between 6-12 days newborns tend to be sleepier for longer stretches so that is a wonderful time for these sessions. Infants older than 12 days may be more alert, but awake babies are so wonderful to photograph! The session tends to be a mix of sleepy snuggles and wide eyed alert moments soaking in their new world. Inside your home is where so many firsts will take place. Documenting your baby's very first days inside the walls they will grow up in is so special. It will give them a glimpse into a time their memory will not allow. Finnouala's Lifestyle Newborn Photography session featured below also included a Newborn Family Film. This film brings tears to my eyes listening to her Daddy sing to her and watching her Mama shower her in kisses while telling her she loves her. You can view the film and the still photographs from this Lifestyle Newborn Session below. 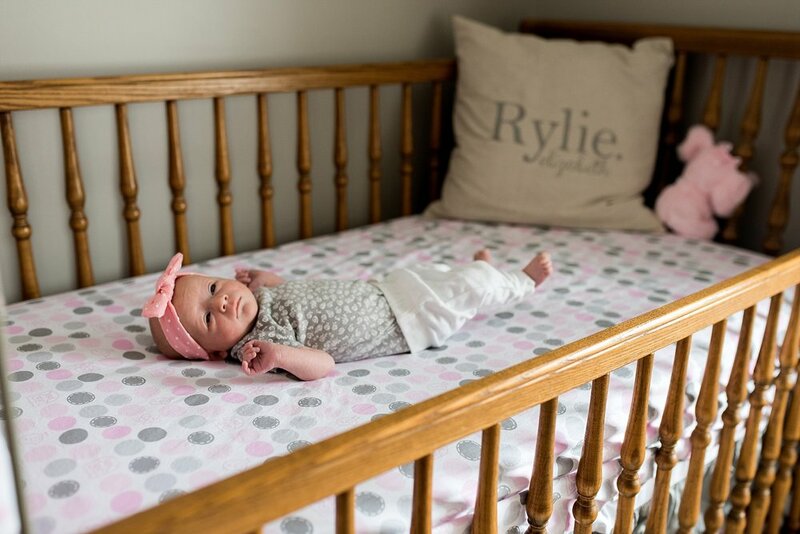 Lifestyle Newborn Photographer, Rebecca Lynne Photography specializes in newborn photography that is relaxed, simple, and natural throughout Connecticut. Offering newborn photography in your home and hospital newborn photography. If you're expecting and looking for a CT Newborn Photographer, let's chat! First Birthday Baby Photography with Rebecca Lynne Photography. And then come back and see all of the amazing images from her birthday party spent with close family! When her Mama, Jess contacted me to document her 1st birthday party with photographs and a Family Film, I was honored and so excited. Jess and her husband, Patrick invited me to document a brunch time celebration for their little girl, with close family. Later in the day more friends and family would come join in on the fun. Before guests arrived we had some cake smash fun and cleaned up by taking a bath in the kitchen sink. We took some time for quiet moments having a bottle on the couch snuggled close to Mama. And also goofing around with mom and dad in the living room. The decorations were up, food was cooking in the oven, and were ready to party. Both sets of grandparents were able to join in on the fun, along with an auntie and uncle. It was wonderful to not only document the birthday party fun of turning one year old. The balloons, decorations, and cake. But to also document life how it is now. Bottles, learning to walk, naps in her crib. All of the things that change so fast as these days speed by. If you are looking for First Birthday Baby Photography, please consider Rebecca Lynne Photography. Rebecca is a CT Baby Photographer specializing in lifestyle and candid baby photography. Using videography during a Newborn Photography Session has got to be one of my favorite things in the world. Capturing all of those tiny movements and sweet kisses in motion with a Family Film, nothing compares to that. Baby Jace was just the sweetest and sleepiest little man during our photography session. At one point mom and dad were trying to wake him gently, but he just wasn't having it. His nursey had the sweetest decore of foxes and woodland critters. You can watch Baby Jace's Newborn Family Film below and also check out some of the still photographs from this session as well. Do you remember those fun home movies from when you were little? You know, the ones where you’re heading out for your first day of school, doing some crazy dance moves in the kitchen, jumping on the bed, or maybe opening presents on Christmas morning? Have you ever watched them now that you're an adult and seen your parents in a new light? Noticing the way their mouths moved when they smile or the way they scooped you up into their arms? Now you can give that to your children, by getting into a family film yourself right along side them, to pass down to your children for generations to come. Give your children the opportunity savor all the little details of their life in motion –how their tiny fingers picked berries from the bush, the way they threw their head back when they laughed as Daddy tickled them. It is your turn to capture those moments for your family and it is time for us to give home videos a makeover. What should we do for the session? That is up to you! What do you enjoying doing together? Baking cookies, playing board games, hiking through the forest, collecting wildflowers in a field, or taking the pup for a walk? What speaks to your heart when you think about watching your film years down the road? What do you want your children to remember about their childhood? I don't think I want to do the session in my home, it isn't clean enough. Mom of two over here...my home isn't spotless (ever) either! Tidy up your house as if you were having friends over. We won't be focusing on every nook and cranny or the dust bunnies under the couch. We can also venture into the yard or another favorite outdoor location. That depends on the activity we are documenting. Baking cookies on a Sunday morning, going for a family hike or strolling through a field at sunset. You can expect an average session to last about 2 hours. "2 hours?Are my kids are going to last 2 hours?" Yeap! My style of photography and film isn't the same as sitting still in a studio in front of a white backdrop while a photographer says "look here! over here!" while squeaking toys to grab their attention. You're able to relax and focus on spending time together as a family, doing activities you enjoy. Will we need to be looking at the camera a lot? My sessions are about interacting with each other and spending time together as a family, I am merely there to document your moments. There will be times where I fade into the background quietly observing and there may also be times where I say "now tickle Dad!" or "jump and spin!" Film sessions aren't much different than my lifestyle photography session. The emphasis is on hugging and kissing, running and jumping, being together as a family and most importantly having fun! Will I be able to have photographs to print after this session too? Yeah! Your film session will include high resolution digital images available for download, with a print release, in addition to your video. We really want to invest in this, but money is a little tight. Can we arrange a payment plan? Of course! We can set up a payment plan custom to your needs. Get in touch and we will work out the details. Ready to book your Family Film? Contact Rebecca Lynne Photography today!